Photographs of German war cemeteries always fascinate me as they not only dispel the myth that Germany never properly commemorated it’s battlefield fallen but that it gives us an insight into how revered their dead was in the same way we treated our own. 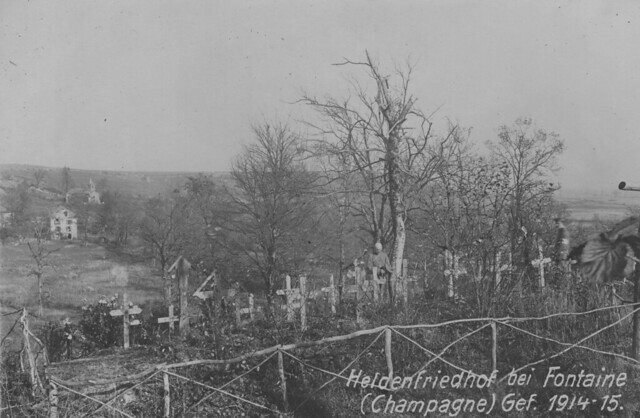 This photograph from 1915 shows a German cemetery just behind their front line in the Champagne sector. There are several villages called Fontaine in this area and it does not appear that a cemetery of this name exists today; it is likely the graves were moved into a larger cemetery post-war. The quality of Great War images is so great that it is possible to enlarge areas of them to get out aspects that might not at first be so obvious. 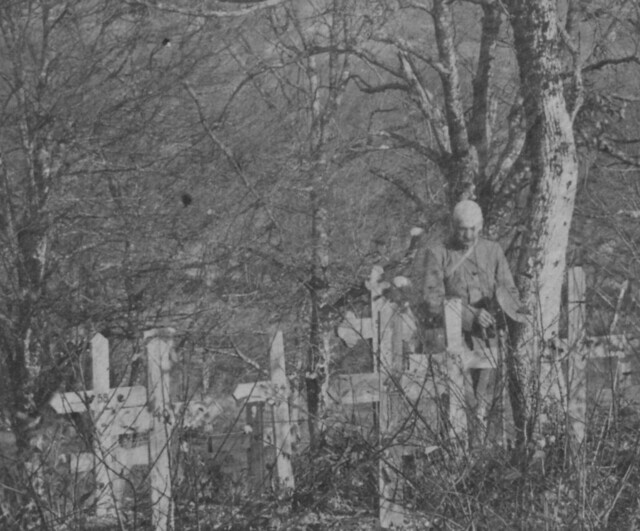 The enlargement of the section below captures a moving moment in time as a German soldier holds his cap in his hand with head bowed, remembering a friend and comrade who lies in the grave before him. This entry was posted on 11/06/2012 by sommecourt. It was filed under Champagne 1915, France, French Army, French Front, Great War, War Cemetery, Western Front, WW1 and was tagged with Champagne, German Army, War Cemetery, WW1.